Let me say first that I’ve always greatly appreciated the classic horror fiction of H.P. Lovecraft. I’ve purchased various books of his macabre tales over the years, and now own a very nice leather bound copy of his complete works. The stories are mostly unique; very much indescribable nightmare creatures left for your own imagination to conjure to the appropriate level of terror. For this reason they are notoriously difficult to portray with any weight on the big or small screen. One of the best attempts I’ve seen is the short of Pickford’s Model, from Rod Serling’s Night Gallery. 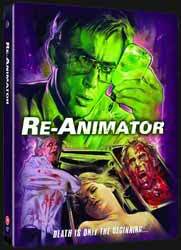 With its Frankenstein-like premise, Herbert West: Re-Animator is perhaps the most straightforward of his stories, so it could be seen to have been the perfect choice for Director Stuart Gordon. The original plan was to develop an anthology of stories for TV, which was almost certainly why Gordon stuck with Lovecraft for his subsequent films, Dagon, Castle Freak (based on The Outsider), From Beyond, and Dreams in the Witch-House (as part of the Masters of Horror series). This film is very much a product of its time. Released in 1985, it was obliged to compete with – and attempt to better – all the brutal but effective horror films of the previous five or ten years, including a handful of classics and a multitude of so-called video nasties. Ironically, the film is played straight and serious for the first third, but then quite suddenly turns into body horror black comedy. The scene with the re-animated black cat is hilarious rather than frightening. The fake cat has been attached to the West character’s back, and flaps around to the sound of angry moggy noises as he attempts to shake it off. Matters become progressively more ridiculous as we reach the final third of the film, before pretty much forgetting the plot to turn into a showcase for fake blood, mad make-up and prosthetics. Dr Carl Hill ruthlessly attempts to steal the serum and West’s notebook, and is killed in the process. However, it makes no sense for West to revive his worst enemy. Except, maybe so he can fight his headless body later on! The cast is very solid, but Jeffrey Combs stands out as practically ideal for the part of West. And David Gale as Dr Carl Hill is a character you love to hate. The film makes its point, and is not that bad in the great scheme of things. What lets it down for me is the balance of comedy. For humour to work properly in horror it has to hit a very fine line, or it can fail miserably. There is absolutely no humour (in fact, there is a great deal of hopelessness) in Lovecraft’s work, so my feeling is that the master storyteller is not being treated with the respect he deserves. Perhaps I’m just being pompous. Certainly, those collectors of milestone horror films who haven’t read Lovecraft will probably enjoy this from the point of a blank canvas. The ending though is telegraphed and somewhat obvious. This 2-disc set incorporates two commentaries on the first disc (one with Producer Brian Yuzna and actors Jeffrey Combs, Robert Sampson, Barbara Crampton and Bruce Abbott; the other with Director Stuart Gordon – the more interesting of the two. There are two versions of the film: the Unrated and brand new 4K restoration, and the Integral version, which is exclusive to Blu-ray. Disc 2 also contains the Re-Animator Resurrectus documentary; Interviews with Stuart Gordon, Brian Yuzna, writer Dennis Paoli, composer Richard Band, and Fangoria editor Tony Timpone; Extended and Deleted Scenes; Trailers and a Gallery. The extras gain an additional point.